Just when it looked like HeroScape was done for, Hasbro hands over the development of HeroScape to Wizards of the Coast, and they've now released an all new 3rd Master Set for the game. This time out the theme is Dungeons and Dragons (D&D), and the new master set is called Master Set 3 Dungeons & Dragons - Battle for the Underdark. This all new set comes with 50 modular hex terrain pieces, 10 new D&D themed figures with stat cards, a new rulebook, and the dice and markers needed to play. If you aren't familiar with HeroScape, it's a game utilizing modular, what I like to call 2.5D, instead of 3D hex terrain tiles, because most are flat, some textured, some not, mixed in with some 3D terrain pieces, like the rock outcrops for example. You pretty-much create your playing surface with the tiles, all of which slide together forming your board. They call this a “build and battle” system. It's clear that these are previously released Wizards D&D Miniatures sculpts, planted on HeroScape round bases, but they are still rather nice. Four of the figures are adventurers, and the remaining six are dungeon dweller types. These are also pre-painted plastic models, and they don't look bad, but these aren't as nice as those from The Adventurers, or Tannhauser board games, but clearly as nice as any other HeroScape models. 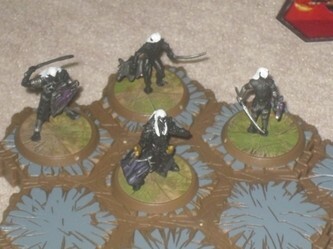 A Drow (dark elves) force is provided, with a leader and three grunts. 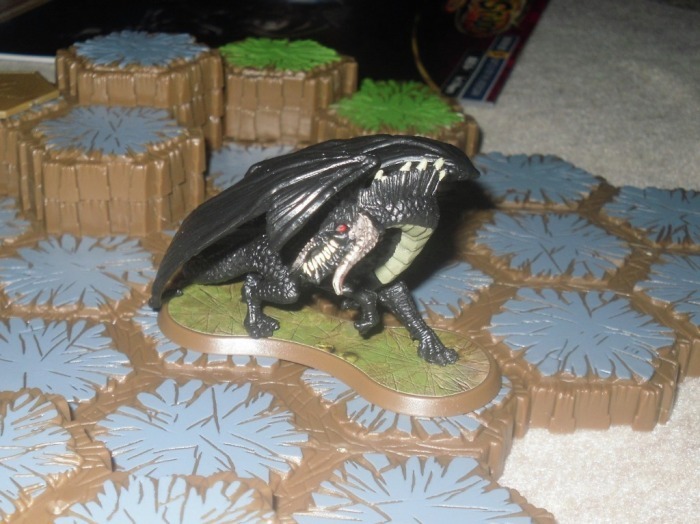 The black dragon, due to his small stature, just doesn't have the same visual impact as the larger dragons they released for HeroScape in the past. 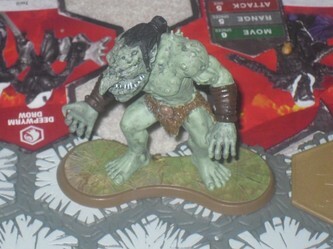 The feral troll is quite nice, he's rather large, and is planted on a double-wide base. Lastly the band of adventurers include a dwarf fighter, human cleric, edadrin wizard and human rogue, all of which look the part. Overall the sides feel balanced in play too. Five scenarios are provided, and if you visit t playdnd.com, you can download even more scenarios to be played out via Battle for Underdark. Even being as small as it is, there are definitely some nice game-play possibilities with this set. The scenarios provided in the rulebook, are each smaller segments of a larger campaign, if you choose to play it that way. My only gripe about HeroScape in general, is the time it takes to setup the elaborate tile configurations to match the scenarios provided. Although you always have the choice of playing the game with your own tile configurations too. The possibilities are endless. 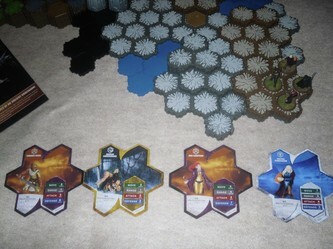 You certainly can't say, that HeroScape isn't flexible, when it comes to playing surface possibilities. Gameplay is quite simple. If you've played HeroScape, there's not much different here. Each card details the stats each character has, and the cards are two sided. One side of the stat card is for use in the Basic game, the other for the Advanced game. The Advanced game adds a few more rules, and a little more complexity, but it's not that much harder to grasp over the Basic game. 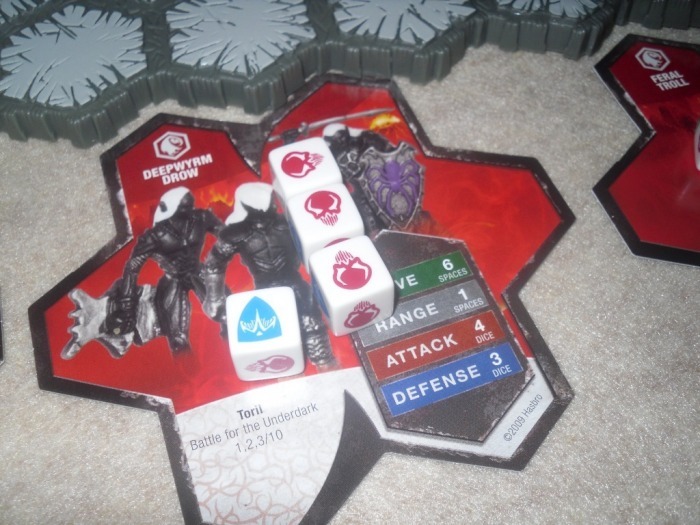 Battle Dice, like those used in all the other HeroScape sets, are utilized to resolve combat in this one as well. These six-sided dice have red Skulls and blue Shields on them, and as the Attacker, rolling Skulls is what you're looking for, and as the Defender, it's Shields you want. The Defender wants to roll equal, or more Shields than the Attacker rolls Skulls, and vice versa, it's that simple. Weapons and abilities dictate how many dice are rolled to attack, and abilities and defense dictate how many dice the defender rolls too. All of this is clearly defined on each stat card, so there's no guessing, or having to go back and forth to the rulebook in the middle of the game. Many common miniature skirmish game rule mechanics are in place too, like attacking from a higher elevation grants a bonus, it cost equal movement points to the height of a piece of terrain you want to climb, some other terrain features cost multiple movement points to cross, there's Line of Sight rules, and so on. Existing HeroScape players will likely buy this set for the terrain tiles alone, as the rock outcrops are cool, there's also new black/shadow tiles, new gold treasure glyphs, and another new repainted existing tile to be had. It's hard to overlook history. 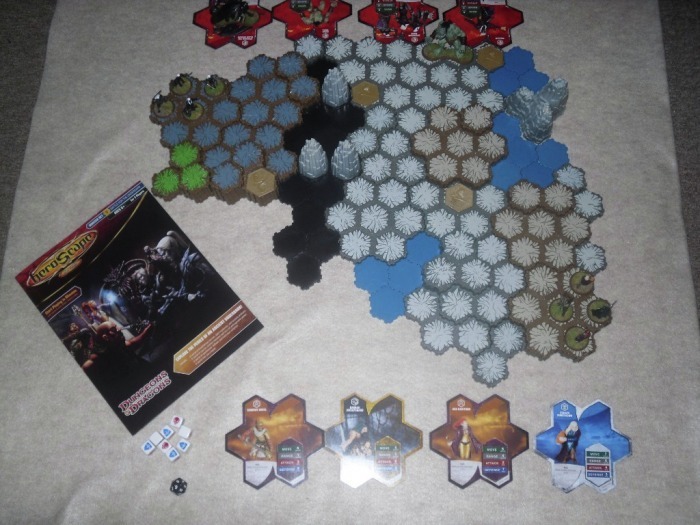 Many comic-book enthusiasts adopted the Marvel Heroscape set. Hasbro also promised to support it with more figures, which they even showed at Toy Fair, and then released nothing for it. Due to the lack of support for the Marvel set, I ended up selling off the Marvel set, and the two previous HeroScape Master sets I owned about six months ago. Having WWII, medieval, or modern-day characters, taking on monsters and armies from other eras, and sci-fi alien troops even, is what made HeroScape a success to begin with. It felt like a tabletop version of the Deadliest Warrior TV show, only with even more options. If they move ahead from this point with D&D HeroScape alone, and don't support the existing HeroScape, by abandoning it like they did the Marvel set, then HeroScape is doomed as a brand. I also don't see why they called this a new Master Set, when it's literally not much larger than the Marvel spin-off set. The previous Master Sets were rather large, and included almost twice as many figures and terrain tiles. The previous Master sets also carried $40+ price tags. In their defense, D&D - Battle for Underdark carries an MSRP of $29.99, and I've seen it selling for as little as $18.99 online. For a $20 bill or less, I really can't knock it, but it's still not worthy of the Master Set title. I'm very familiar with Wizards existing D&D Miniatures line, because I played the skirmish game for a number of years. D&D - Battle for Underdark is nothing like the D&D Miniatures skirmish game either. While Wizards quit supporting the D&D Miniatures skirmish game rules, in favor of using D&D Minis solely in D&D 4th Edition, there's still almost 20 booster packed expansions worth of product out there to purchase, and with those rules and miniatures you can play a better game of D&D skirmish battles. A group called the DDM-Guild also continue to support new releases of D&D Miniatures with stats for the old skirmish game system. Therefore, technically the D&D Minis Skirmish game is still alive and well. Battle for Underdark is, however, a more simplified, and HeroScape-d introduction to the world of D&D, if that makes any sense. It's clear that their idea is to introduce D&D to a whole new generation of players through Battle for Underdark, and it just might work. 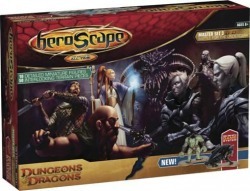 On the flip side, this isn't a good starter set to introduce players to HeroScape. 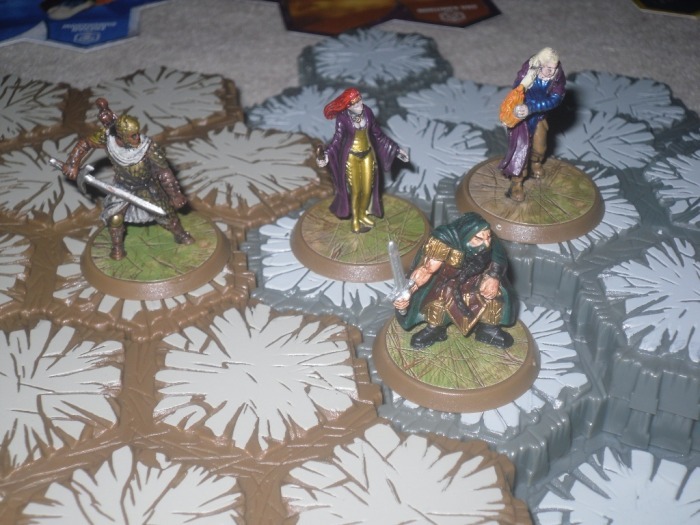 Classic HeroScape has a broader focus, and Battle for Underdark doesn't even begin to capture what made HeroScape popular, most notably the mixing of the characters from various eras and genres. I really can't recommend this for fans of the existing D&D Miniatures game either. The problem is there are many existing D&D Miniatures players, who already use the hex terrain alone from HeroScape to play it, and D&D 4th Ed with, and the older D&D Miniatures game system, and D&D 4th Ed both are, quite frankly, better games than D&D HeroScape. For them Battle for Underdark would be totally pointless. Having said that...D&D – Battle for Underdark is actually a very good stand alone game, at an attractive price if you can pick it up online for around $20-$25. I also think this is definitely more of a kids, and family game, than it is a true skirmish based wargame with miniatures. It does say it's for ages 8+, and that would be accurate. Think of it as a more simplified version of HeroClix, minus the clix part, with 2.5D terrain tiles, only with D&D characters. It's a nice set, but it's so specialized, and tries to blend two existing games, into a new experience, and it's neither as robust as D&D Miniatures, or a good starting point to introduce players to HeroScape. 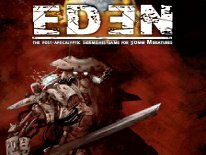 It's its own self-contained, and very simplified introduction to the concept of D&D, utilizing the HeroScape terrain and rules, and recycled D&D Miniatures. 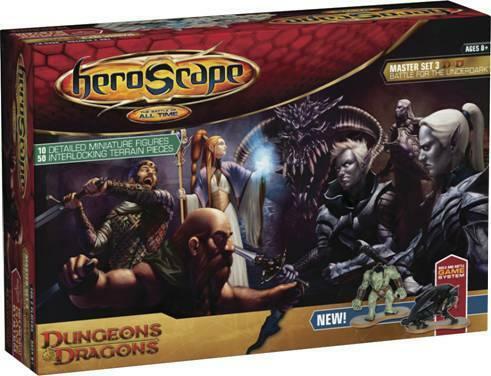 One thing is clear, at least it looks like Hasbro/Wizards is ready to support D&D HeroScape, as I've seen actual retail packaged images of new upcoming D&D branded expansion figure products for HeroScape all over the internet. 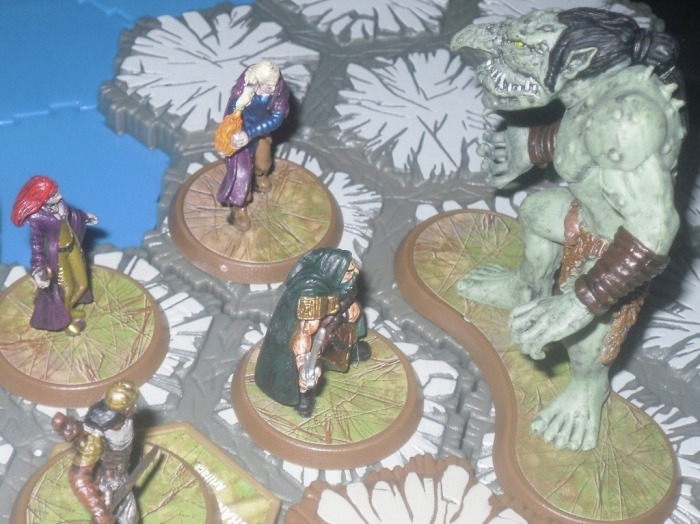 Even if they're just more recycled D&D Miniatures, at least there's a future for D&D HeroScape, too bad the same couldn't be said for the Marvel set. It also remains to be seen how, or if they'll support the now "classic" HeroScape from here on out since their focus seems to be set so much on only D&D Heroscape at present.